Find hotel near Museum Of The Atlantic Wa .. There is a lot to see in the Museum of the Atlantic Wall, Ouistreham. With contemporary museums present in Germany, this museum takes you through the horrific incidents that occurred behind the Atlantic Wall. A lot of films have been shot here to re create the happenings. There is also a museoscopy, various documents, pictures, history about the architect present here to give you a more in depth idea about all that happened at the Atlantic Wall. Want to plan a DIY trip? Use Ouistreham trip planner for the same. You can enjoy a comfortable stay in the city by booking the best hotels in Ouistreham like Kyriad Caen Sud, Appart' City Caen, HÃÃƒÂ´tel Restaurant Inter-hÃÃƒÂ´tel Otelinn and HÃÃƒÂ´tel Des Quatrans. There are plenty of ready-to-book Ouistreham vacation packages available that will cover the major attractions, accommodation concerns including the prime one like how to reach Ouistreham. Love this? Explore the entire list of places to visit in Ouistreham before you plan your trip. Fancy a good night's sleep after a tiring day? Check out where to stay in Ouistreham and book an accommodation of your choice. My third visit. I still find it fascinating. An informative couple of hours. The history of the grand bunker, albeit very short, is incredibly interesting. From the small number of German soldiers who were stationed here, to the British Engineers, the 'tommies' who took the bunker several days after the main invasion by tricking the Germans inside. When visiting you get the feel for what it must have been like to have lived inside it, the small cramped rooms. The entrance was so well defended, trying to take it must have been daunting. In essence it was an observation post for the German guns and batteries along the coast, but still nevertheless a formidable yet relatively small structure. You can clearly see it from the ferry as you arrive and depart Ouistreham. You can visit for as short or as long as you wish, having visited three times now there's still always more to each visit. Its so important that this history remains. I have enjoyed my visits here, fond memories visiting with good friends, one who is very sadly no longer with us who I will always remember sat smiling in the main observation room during our visit in 2016. A fascinating museum located in an old German coastal defense bunker. Very detailed information plaques offer a ton of information throughout the museum. It can get a bit cramped to navigate if there are a lot of other visitors (there are some narrow halls, low ceilings and tight spiral staircases) so it may not be the best place to visit during peak tourist season. But certainly a worthwhile visit for anyone interested in WWII history. 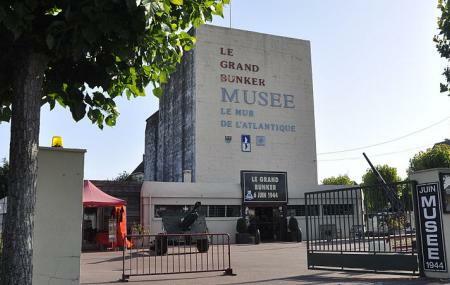 Even if you don't want to pay the admission to visit the bunker, you can still see a couple artillery guns and a D-Day landing craft (used in the filming of Saving Private Ryan) outside in the courtyard. Very interesting museum. A must visit to understand what went on during the 2nd world war .all the artifacts on display .sad .